Our commercial septic system repair experts in Tampa, FL can offer recommendations for repairs or tell you when you need to have a new tank installed. If your business is located in a rural area, it will require a septic system to process waste and liquid that comes out of the building. Septic tanks offer a self-contained way to process and move waste out of the pipes from sinks, toilets, and any other drains. Every aspect of your septic system performs an important role, so commercial septic system repair should only be done by an expert. At Southern Water & Soil, we offer this service to businesses in and around Tampa, Florida. If any part of your septic system is not working, it can throw off the whole process, leading to leaks or backup of pipes, so call us right away. We offer emergency service throughout the Tampa area. 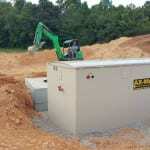 There are two major kinds of septic systems: alternative and gravity-based. Alternative systems use a pump to push the liquid through the system, so watch for signs that the pump is weakening or going out, since this can cause the system to back up. Our commercial septic system repair experts can offer recommendations for repairs or tell you when you need to have a new tank installed. If your business produces a high volume of water or waste, a commercial tank that can hold more may be a better option. At Southern Water & Soil, our list of services includes commercial septic system repair, septic tank cleaning and pumping, and septic tank replacement. We also offer routine maintenance contracts, which can help prevent bigger problems down the road. Contact us today for more information.